November 2017…Philadelphia Phillies Chef Keith Rudolf compares learning how to cook to learning how to play a sport. 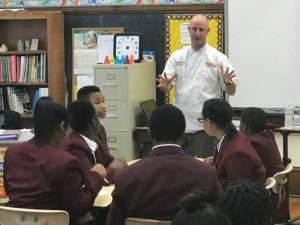 Like athletes, chefs need to practice a lot, Chef Keith told the Saint Martin de Porres Healthy Saint staff during a recent press conference. During the wide-ranging interview with the eighth grade reporting staff, Chef Keith shared how he became a chef, the types of jobs he’s had, how he prepares nutritious food for the Phillies, and how exciting it is to work with the team. He joined the organization in early 2017. Chef Keith told the reporters that it is important to acquire as much experience as you can in your profession. He worked his way up from his first job as dishwasher to becoming a sous chef at the Standard Hotel on Sunset Boulevard in Hollywood, California, and working for Georges Perrier at Le Mas Perrier/georges’ in Wayne, Pennsylvania. The Healthy Saint reporters will publish their articles from their interview with Chef Keith in their school health newspaper and Healthy NewsWorks will post them on its website. Stay tuned! During 2017-18, Healthy NewsWorks is overseeing 14 health newspaper programs in elementary and middle schools. St. Martin de Porres, an Independence Mission School, is in its fourth year with the program.